Ask God to give you a soft heart, that as you read his word you will understand it, and respond to it with repentance and faith. Read Jonah 1. The word of the Lord comes to Jonah. What is he instructed to do? Why? What does he do? Why do you think he does this? 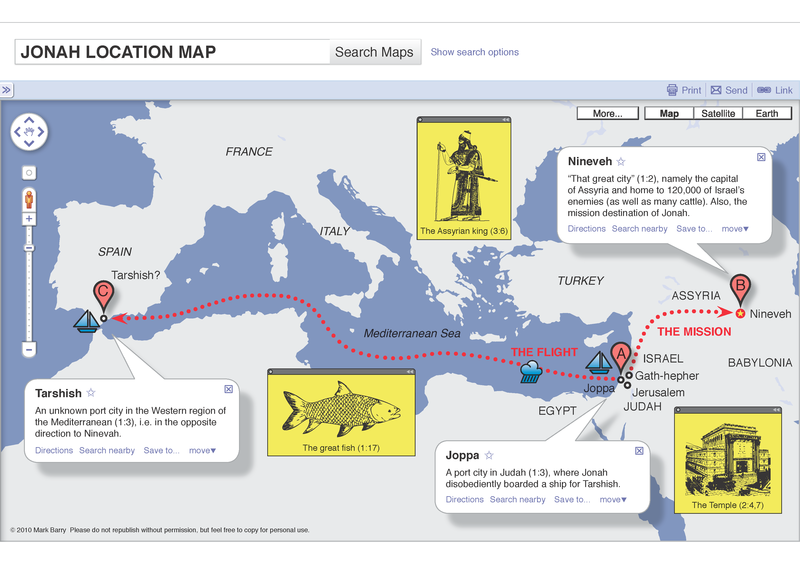 You might like to check out this map to get an idea of Jonah’s journey. While sailing to Tarshish, a great storm threatens the ship. How do the sailors respond to the storm? How does Jonah respond? When confronted by the sailors, how does Jonah introduce himself? What solution does he suggest? How do the sailors respond when they see the power of the LORD in calming the storm? How does their response compare to the way Jonah has responded to God in this chapter? The God who made the earth and sea has spoken to us in his word. Do you take it seriously? How might you cultivate an appropriate fear of the Lord? Praise God for who he is; the creator and sustainer of all things. Ask God to grow in you a fear of him and a delight in obeying his word.